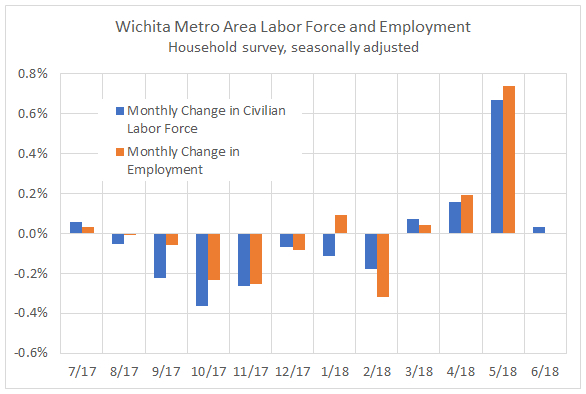 For the Wichita metropolitan area in October 2018, jobs are up, the labor force is up, and the unemployment rate is down, compared to the same month one year ago. Seasonal data shows a slowdown in the rate of job growth. Total nonfarm employment rose from 296,900 last October to 299,000 this October. That’s an increase of 2,100 jobs, or 0.7 percent. (This data is not seasonally adjusted, so month-to-month comparisons are not valid.) For the same period, jobs in the nation grew by 1.7 percent. The unemployment rate was 3.3 percent, down from 3.5 percent one year ago. Considering seasonally adjusted data from the household survey, the labor force rose by 719 persons (0.2 percent) in October 2018 from September 2018, the number of unemployed persons rose by 283 (2.7 percent), and the unemployment rate was unchanged at 3.5 percent. The number of employed persons not working on farms rose to 298,219 in October from 297,783 the prior month, an increase of 436 persons, or 0.1 percent. For the second quarter of 2018, the number of jobs in Sedgwick County grew slightly slower than the nation. 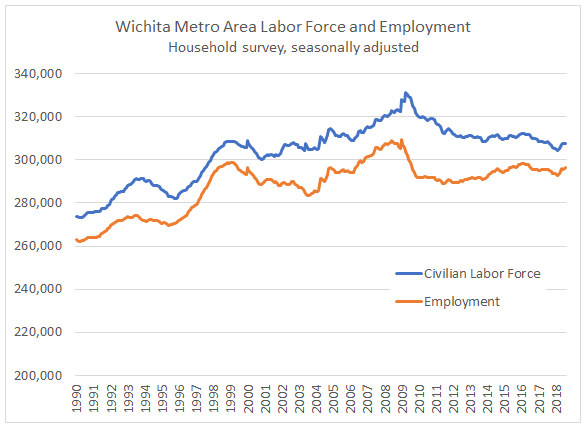 Data released today from the Bureau of Labor Statistics, part of the United States Department of Labor shows an improving labor picture in Sedgwick County, growing at a rate 80 percent of the nation. These are figures from the Quarterly Census of Employment and Wages program. The average weekly wage was $882, an increase of 2.7 percent over the year, that change ranking 204 among the same 349 largest counties. The U.S. average weekly wage was $1,055, increasing by 3.4 percent over the same period. For October 2018, an expanding labor force in Kansas, and a slight increase in jobs from September. Data released this week from the Bureau of Labor Statistics, part of the United States Department of Labor, shows an improving jobs picture for Kansas in September 2018. Over the year (October 2017 to October 2018), the Kansas labor force is up by 0.4 percent, also rising slightly over the past three months. The number of unemployed persons was essentially unchanged from September to October. The unemployment rate was 3.3 percent in October, down from 3.5 percent from one year ago, and unchanged from August and September. The number of Kansas nonfarm jobs for October 2018 rose by 19,500 or 1.4 percent over last October. This is using seasonally adjusted data, and the non-adjusted figure is nearly the same at 19,600. From September 2018 to October 2018, nonfarm employment in Kansas grew by 400, which is 0.03 percent. For 2017, personal income in Wichita rose, but slower than the national rate. Today Bureau of Economic Analysis, an agency of the United States Department of Commerce, released personal income figures for metropolitan areas through the complete year 2017. 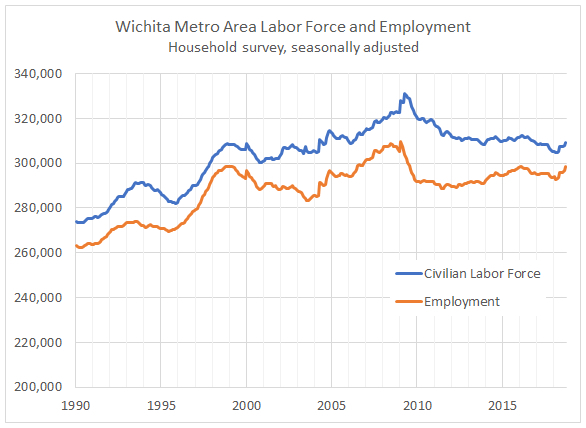 For the Wichita metropolitan statistical area, personal income in 2017 rose from the 2016 level in nominal dollars, and is now slightly less than the 2104 level. For all metropolitan areas in the United States, personal income rose by 4.5 percent. For the Wichita metro area, the increase was 2.3 percent. 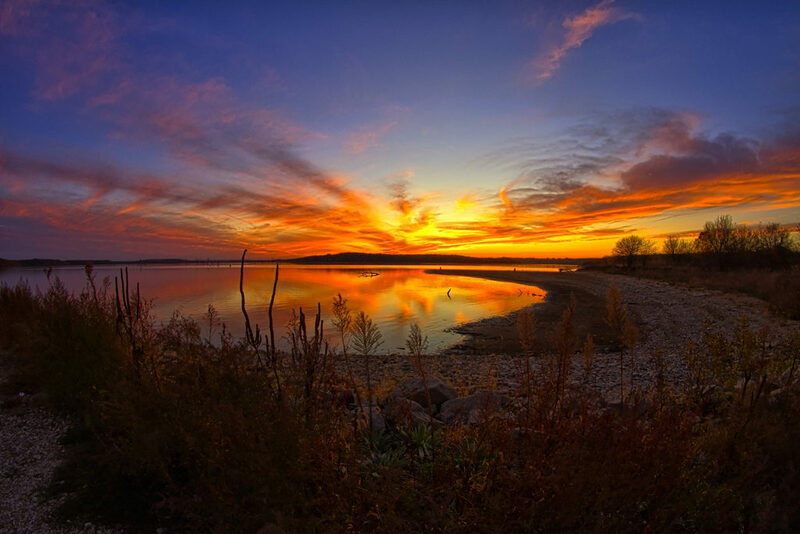 Of 383 metropolitan areas, Wichita’s growth rate was at position 342. 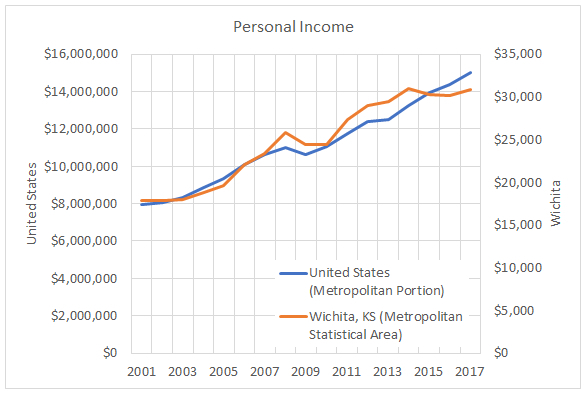 While the Wichita area has kept up with national personal income growth and even surpassed it in some years, that is no longer the case. 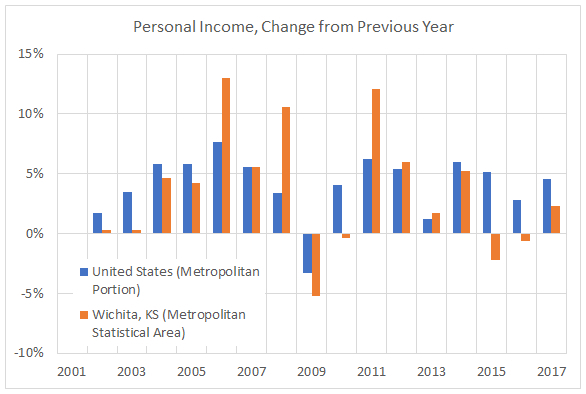 Wichita’s income has stalled while national income continues to grow. 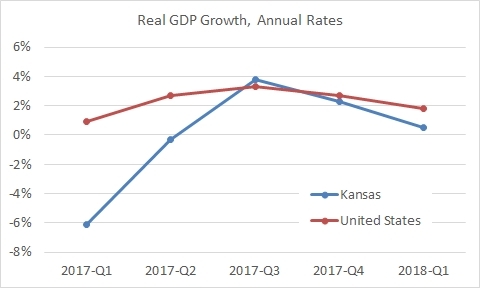 In the second quarter of 2018, the Kansas economy grew at the annual rate of 4.7 percent, the seventh-best rate in the nation. 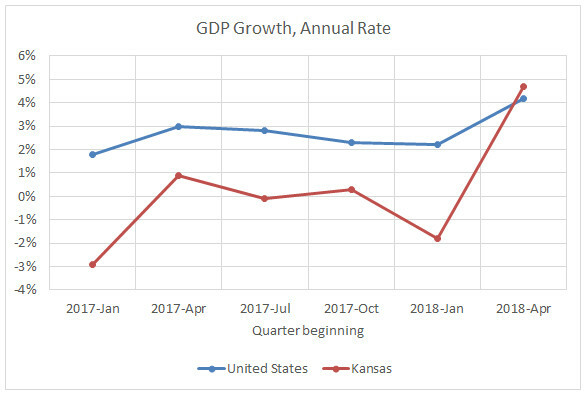 In the second quarter of 2018, the Kansas economy grew at the annual rate of 4.7 percent in real (inflation-adjusted) dollars, according to statistics released today by Bureau of Economic Analysis, a division of the United States Department of Commerce. GDP for the quarter was at the annual rate of $164,018 million. This is a sharp jump in the rate of growth from the first quarter of 2018, when the rate was 0.5 percent, with only three states having lower rates. 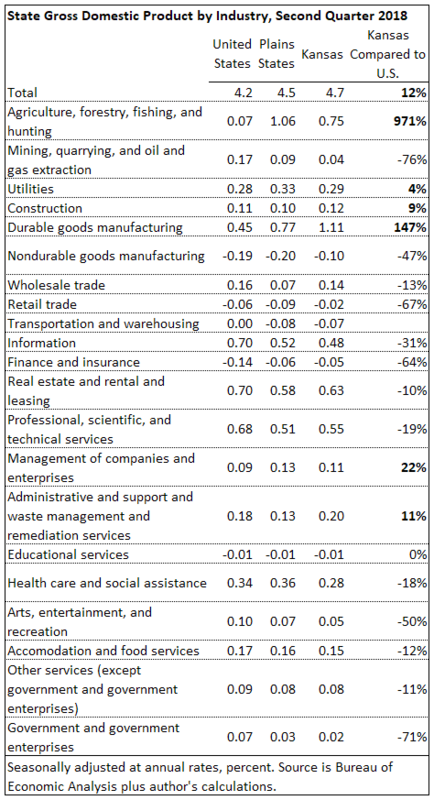 For Kansas, industries that differed markedly from the nation include agriculture, forestry, fishing, and hunting, and durable goods manufacturing. The nearby table shows more industries. 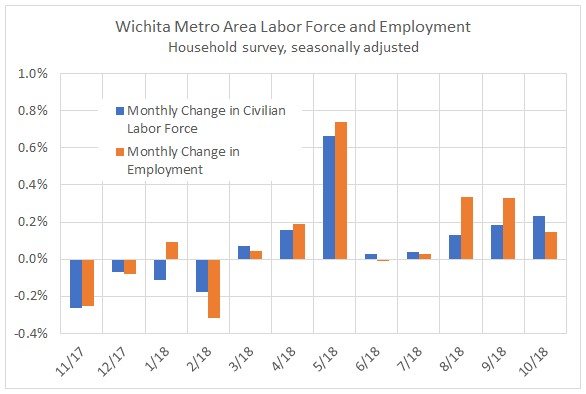 For the Wichita metropolitan area in September 2018, jobs are up, the labor force is up, and the unemployment rate is down, compared to the same month one year ago. The unemployment rate fell to 3.3 percent, down from 3.9 percent one year ago. Considering seasonally adjusted data from the household survey, the labor force rose by 1,315 persons (0.4 percent) in September 2018 from August 2018, the number of unemployed persons fell by 398 (3.6 percent), and the unemployment rate fell to 3.5 percent from 3.6 percent. The number of employed persons not working on farms rose to 298,510 in September from 296,797 the prior month, an increase of 1,713 persons, or 0.6 percent. For September 2018, more jobs in Kansas than last September, but fewer than in August. Over the year (September 2017 to September 2018), the Kansas labor force is up slightly, and also rising slightly over the past three months. These changes are small, all being in the range of 0.1 percent or less. The number of unemployed persons continues to fall, declining by 1.3 percent from July to August. The unemployment rate was 3.3 percent in September, down from 3.6 percent from one year ago, and unchanged from August. The number of Kansas nonfarm jobs for September 2018 rose by 1.4 percent over last September, adding 19,600 jobs. This is using seasonally adjusted data, and the non-adjusted figure is slightly larger at 20,600. From August 2018 to September 2018, nonfarm employment in Kansas fell by 6,900, which is 0.5 percent. A look at some of the large economic development programs in Wichita and Kansas. 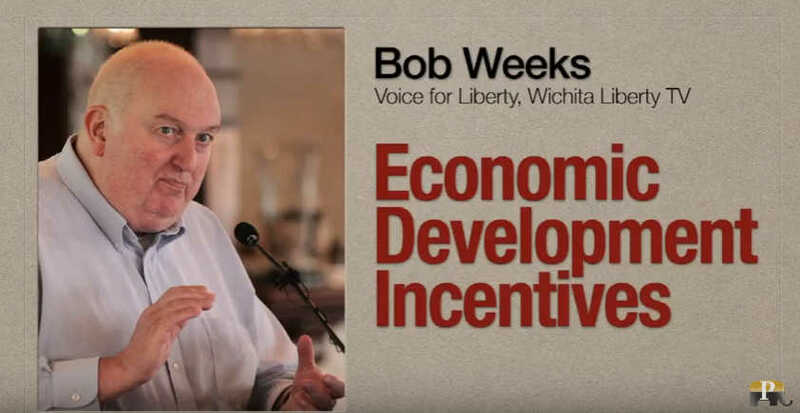 Here’s video of a presentation I gave at the Wichita Pachyderm Club this week on economic development incentives. The video was produced by Paul Soutar of Graphic Lens. View below, or click here to view at YouTube. Industrial revenue bonds in Kansas: Industrial Revenue Bonds are a mechanism that Kansas cities and counties use to allow companies to avoid paying property and sales taxes. Wichita TIF projects: some background: Tax increment financing disrupts the usual flow of tax dollars, routing funds away from cash-strapped cities, counties, and schools back to the TIF-financed development. TIF creates distortions in the way cities develop, and researchers find that the use of TIF means lower economic growth. 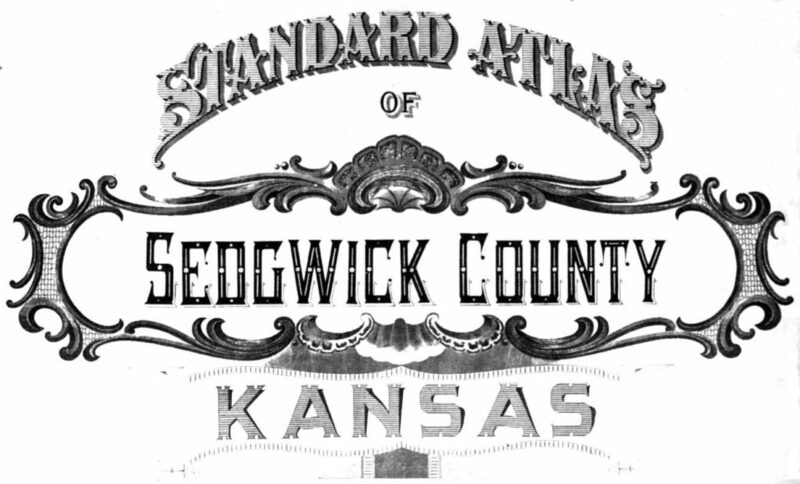 Community improvement districts in Kansas: In Kansas Community Improvement Districts, merchants charge additional sales tax for the benefit of the property owners, instead of the general public. 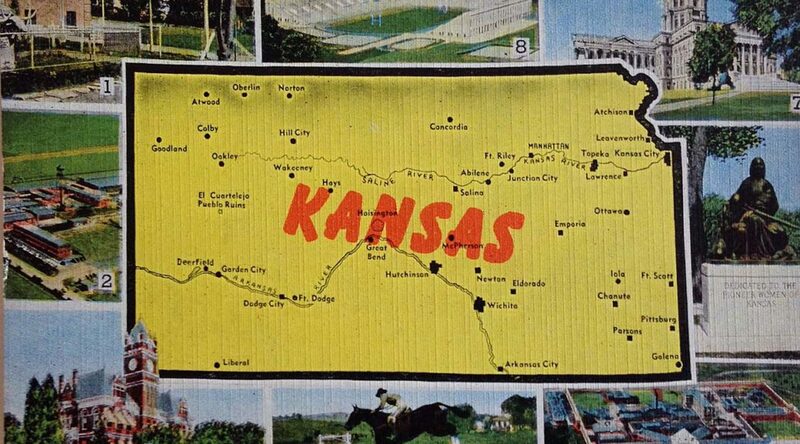 STAR bonds in Kansas: The Kansas STAR bonds program provides a mechanism for spending by autopilot, without specific appropriation by the legislature. PEAK, or Promoting Employment Across Kansas: PEAK, a Kansas economic development incentive program, redirects employee income taxes back to the employing company. 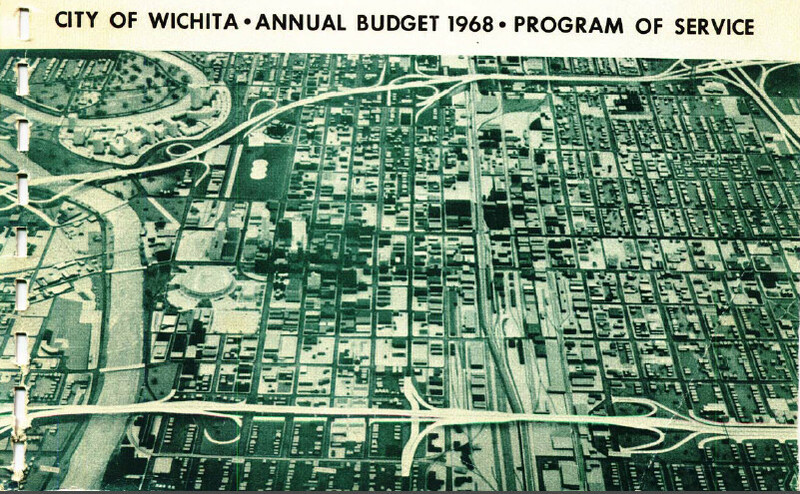 Historic preservation tax credits, or developer welfare: A Wichita developer seeks to have taxpayers fund a large portion of his development costs, using a wasteful government program of dubious value. 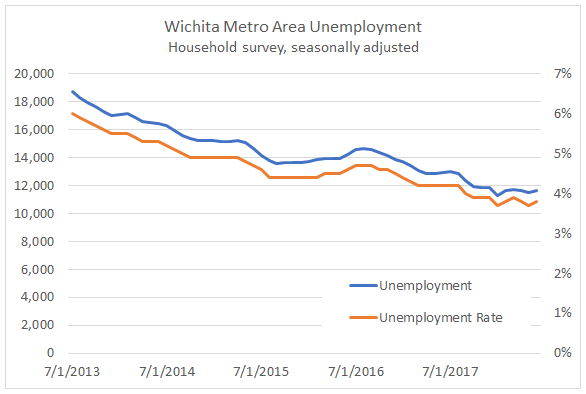 For the Wichita metropolitan area in August 2018, jobs are up, the unemployment rate is down, and the labor force is smaller, compared to the same month one year ago. The unemployment rate fell to 3.8 percent, down from 4.6 percent from a year ago. Considering seasonally adjusted data from the household survey, the labor force rose by five persons from July 2018, and the number of unemployed persons fell by 511 (4.7 percent), and the unemployment rate fell to 3.6 percent from 3.8 percent. The number of employed persons not on farms rose to 296,366 in August from 295,810 the prior month, an increase of 556 persons, or 0.2 percent. 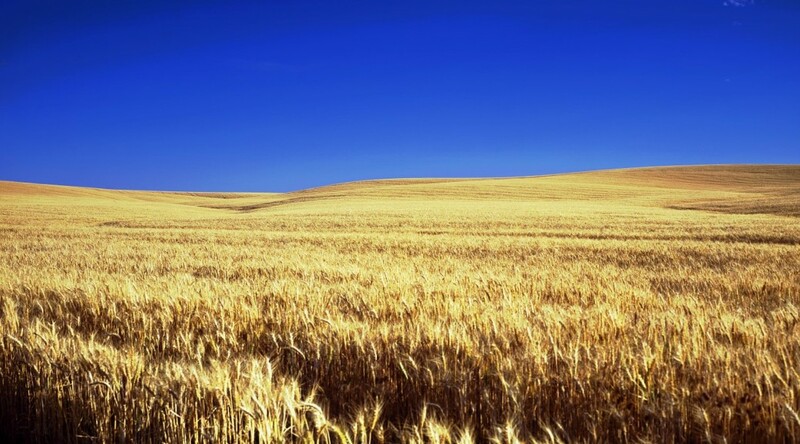 What is the importance of agriculture to the Kansas economy? 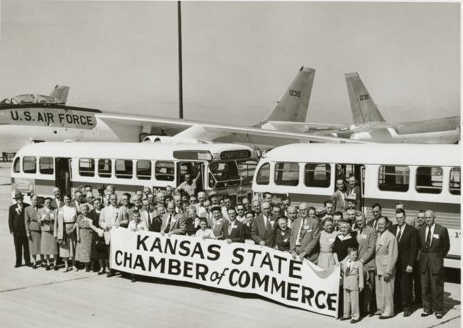 The Kansas Department of Transportation produced a study that finds: “In 2017, $20.6 billion in annual economic benefit was supported by aviation and aviation-related activities in Kansas, supported nearly 91,300 jobs, and generated more than $4.4 billion in annual payroll.” 3 $20.6 billion is 14.9 percent of the $138.328 billion Kansas economy. The nonalcoholic beverage industry says: “With a direct economic impact of $2.0 billion.” Then “Factoring in this retail impact further broadens the economic reach of the nonalcoholic beverage industry by an additional $1.7 billion beyond what our industry generates directly.” 4 The total of $3.7 billion is about 2.7 percent of the Kansas economy. That’s coming just from nonalcoholic beverages. We can easily find other examples of industry groups emphasizing their importance to the Kansas economy. But these findings are almost always exaggerated, especially in the case of agriculture. For example, the Kansas Department of Agriculture says “Using the most recent IMPLAN data available (2015) adjusted for 2017, 65 agriculture, food, and food processing sectors were analyzed to determine their overall contribution to the Kansas economy. These 65 sectors have a total direct output of approximately $47.9 billion and support 125,714 jobs in Kansas.” 5 The document says this is 31.6 percent of Kansas GDP. Adding indirect and induced effects results in $67,461,102,358 ($67.5 billion) in economic contribution, which the Department of Agriculture says is 44.5 percent of Kansas economic output, also called gross domestic product (GDP). All this is true. But we need to be careful when counting contributions to the whole. Here, when farmers eat at restaurants, that is counted as induced effects of agriculture contributing to Kansas GDP. But, the restaurant industry counts the production and serving of these meals as its own direct output to Kansas GDP. Similarly, when the restaurant buys food from a farmer, the purchase counts as indirect effects of the restaurant industry as they purchase inputs and contribute to Kansas GDP. The farmer, of course, considers that as his direct output, again contributing to Kansas GDP. This economic activity is good and natural, and the more, the better. But we can’t count it twice when allocating GDP to industries. Consider the industry category “Dog and cat food manufacturing,” said by the Department of Agriculture to employ 2,183.7 people in Kansas, producing $3,125,350,139 ($3.1 billion) in contribution to the Kansas GDP. That’s 2.2 percent of Kansas GDP. Should all the output of this industry be considered part of Kansas agriculture? The manufacturing industry counts this as part of its contribution to GDP. It’s true that the inputs to the manufacturing are agricultural products, but we don’t know if they are ag products that are produced in Kansas and should be counted as part of Kansas GDP. 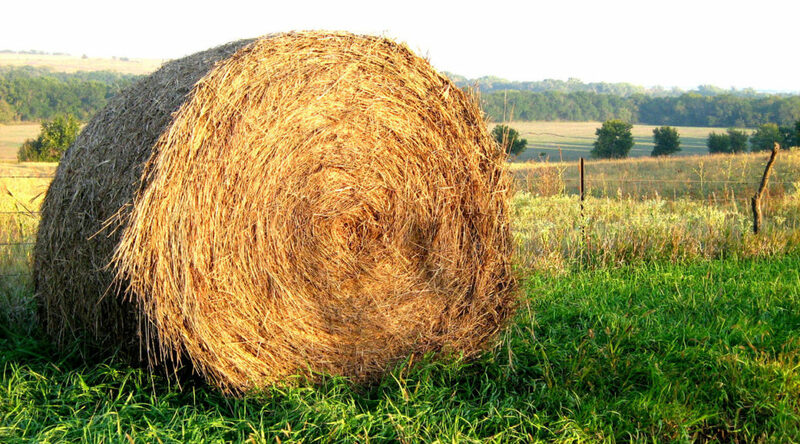 The nearby table shows that for 2017, agriculture counted for 3.2 percent of the Kansas economy. For the period 1997 to 2017, it was 2.7 percent. There are many industry groups with greater output than agriculture. It’s true that when an industry produces economic activity, it spawns other economic activity. These are the indirect and induced effects that IMPLAN produces. But these numbers are hugely inflated. When considering all industries, economic activity is counted more than once. When it suits their needs, industry groups, like other special interest groups, use IMPLAN to boost their importance. Consider manufacturing, which at 16.4 percent of GDP is the second-largest industry in Kansas. When manufacturing companies appeal to state or local government for subsidies, they use IMPLAN or related mechanisms to inflate their importance. Almost everyone does this. It’s standard procedure. Except: When multiple industries the same indirect and induced economic activity, such analysis becomes meaningless. 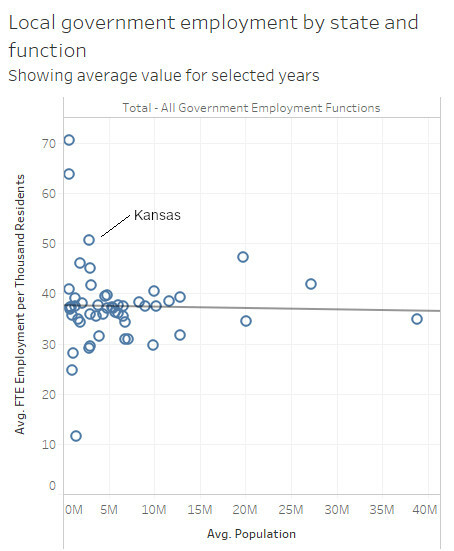 If we added up the IMPLAN-calculated value of each industry to the Kansas economy, we’d end up with a value several times larger than the actual value. 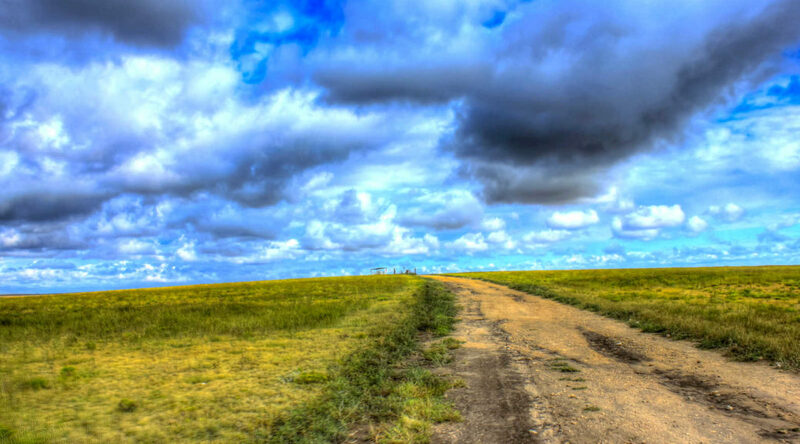 This is what the Kansas Department of Agriculture has done. We expect this behavior from companies or local economic development agencies when they appeal for economic development incentives and other forms of special treatment. They need to inflate their importance to gullible government bureaucrats and elected officials. But government agencies should not do this. On the other hand, what is the harm in overstating the importance of an industry? The harm is that policy decisions are made using false evidence. For August 2018, more jobs in Kansas, and a nearly unchanged labor force. 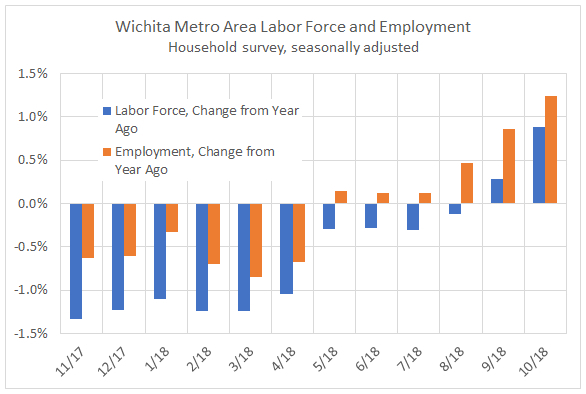 Wichita jobs also rose. Data released this week from the Bureau of Labor Statistics, part of the United States Department of Labor, shows an improving jobs picture for Kansas in August 2018. Over the year (August 2017 to August 2018), the Kansas labor force is down slightly, while up slightly over the past three months. These changes are small, all being in the range of 0.1 percent or less. The number of unemployed persons continues to fall, declining by 1.4 percent from July to August. The unemployment rate was 3.3 percent in August, down from 3.6 percent from one year ago, and from 3.4 percent in July. The number of Kansas nonfarm jobs for August 2018 rose by 1.9 percent over last August, adding 26,600 jobs. This is using seasonally adjusted data, and the non-adjusted figure is larger at 29,900. From July 2018 to August, jobs in Kansas rose by 3,600, which is 0.3 percent. Comparing July 2018 to August 2018 isn’t meaningful using this data, as it is not adjusted for seasonality. Photo by Patrick Emerson. Used under a Creative Commons license. An interactive visualization of gross domestic product by metropolitan area and industry. The Bureau of Economic Analysis, an agency of the United States Department of Commerce, gathers data about economic output, known as gross domestic product. The visualization presented here presents this data in tabular and graphic form. Wichita and national GDP. Click for larger. The GDP figures are real, meaning adjusted for inflation. They are annual numbers through 2017. The release this week also includes revisions for the prior year. In the case of Wichita, the revision was significant, with a loss in GDP being revised to a gain. 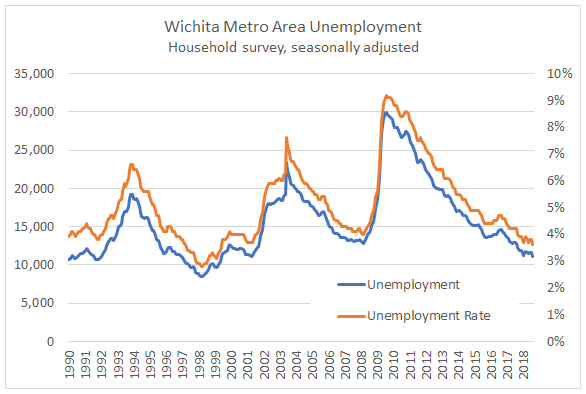 See Wichita economy shrinks, and a revision for details. A nearby example from the visualization compares Wichita metro GDP growth to that of the nation’s metropolitan areas. Click here to access this visualization. The Wichita economy shrank in 2017, but revised statistics show growth in 2016. 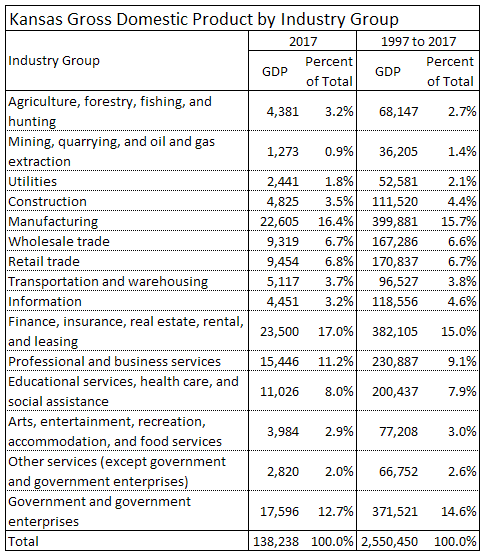 Statistics released today by the Bureau of Economic Analysis, an agency of the United States Department of Commerce, show gross domestic product (GDP) figures for metropolitan areas. Also included are revised statistics for previous years. 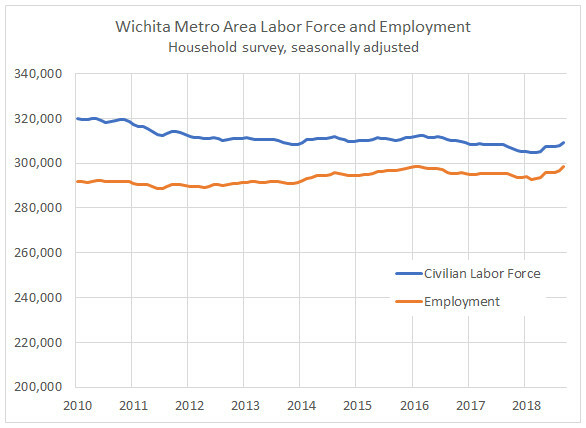 For 2017, the Wichita metropolitan area GDP, in real dollars, fell by 1.4 percent. Revised statistics for 2016 indicate growth of 3.8 percent for that year. Last year BEA reported growth of -1.4 percent. In the revised statistics released today, GDP in 2012 was 28,346 million in chained 2009 dollars. In 2017 it was 29,610 million, a change of 1,264 million or 4.4 percent. For all U.S. metropolitan areas, the same statistic increased from 13,692,212 million to 15,224,212 million, an increase of 1,532,000 million or 11.2 percent. 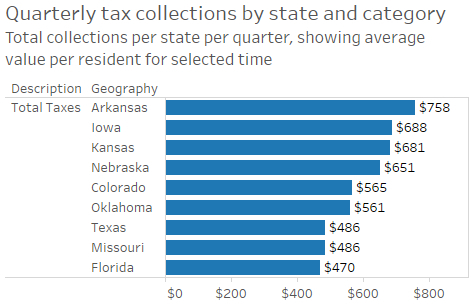 Among nearby states, Kansas collects a lot of taxes, on a per-resident basis. The United States Census Bureau collects data from the states regarding tax collections. Some data is available for each quarter subdivided by category. From the first quarter of 2011 to the first quarter of 2018, Kansas and its local governmental units collected an average of $681 per quarter per resident in taxes. Of nearby states and a few others, Arkansas and Iowa had higher values, and Iowa is higher by only one percent. Some states had lower values, such as Colorado at $565 per quarter per resident (17.0 percent less than Kansas), Texas and Missouri both at $486 (28.6 percent less), and Florida at $470 (31.0 percent less). To learn more about this visualization and create your own, click here. 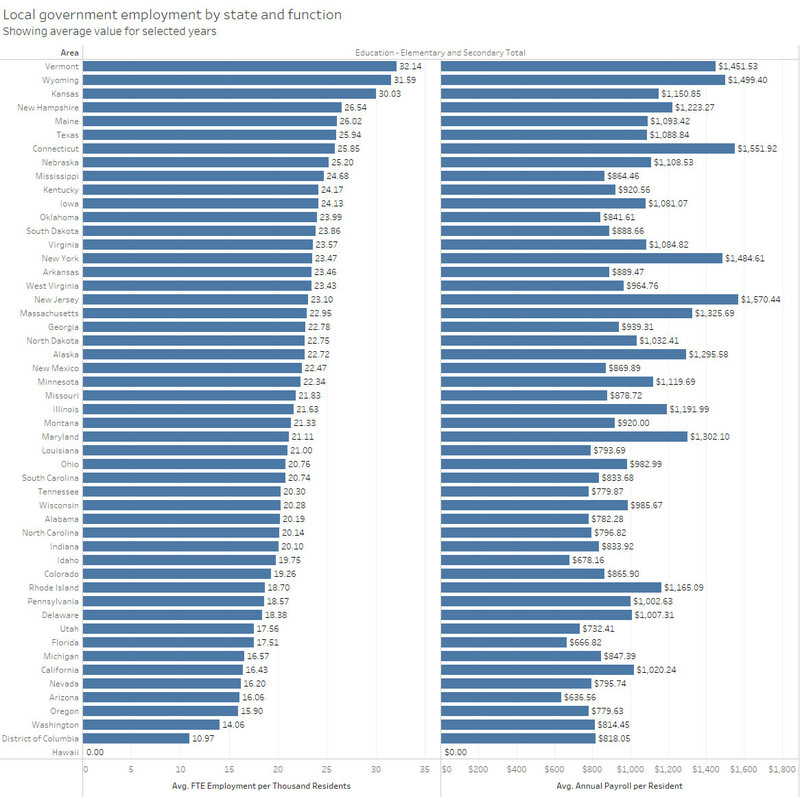 Kansas has nearly the highest number of local government employees per resident, compared to other states. 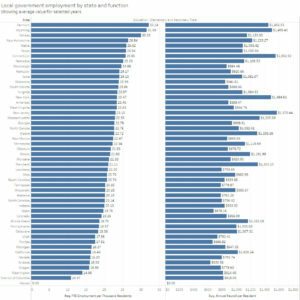 Local government employment by state. Click for larger. Local government employment in education. Click for larger. 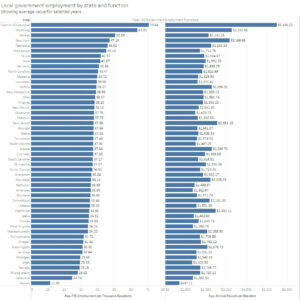 For all local government employees, Kansas had 50.59 per thousand residents in 2016, higher than all states (and areas) but the District of Columbia and Wyoming. These employees had an annual payroll of $2,141.16 per resident. Ten states were higher. 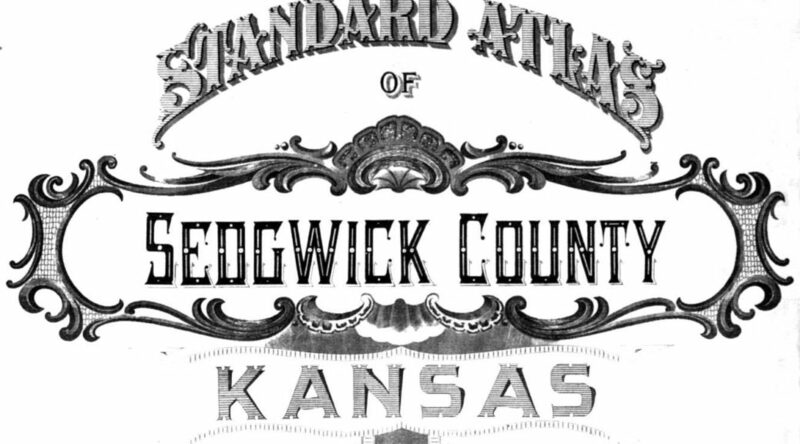 Considering elementary and secondary education, Kansas had 30.03 such employees per thousand residents. This was higher than all states but Vermont and Wyoming. 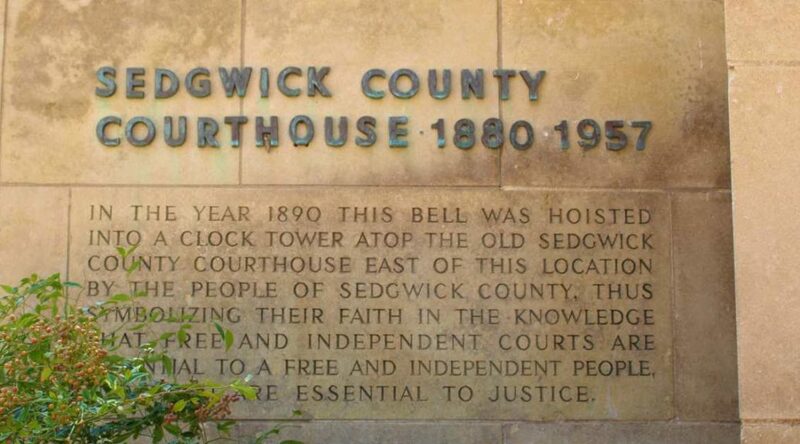 The payroll for these employees was $1,150.85 per resident, with eleven states above Kansas. 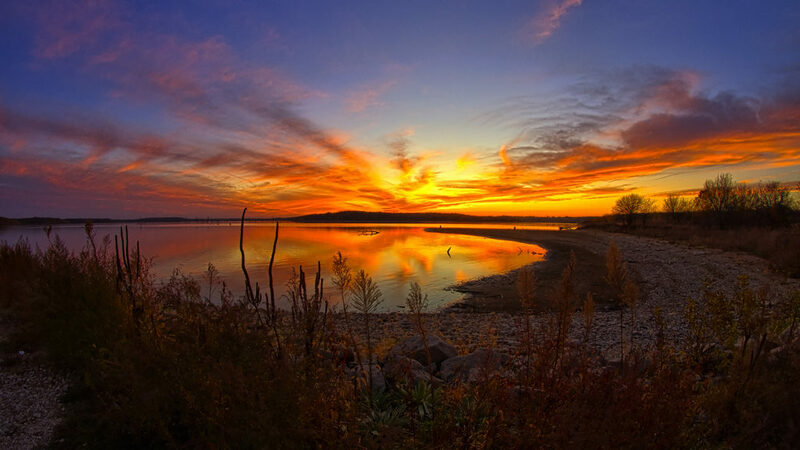 Kansas is a small state in terms of population. Might small states have higher needs for employees on a per-resident basis? A plot of employees vs. population shows nearly no relationship between the two. These are local government employees only. State and federal government employees are not included. The source of this data is the United States Census Bureau. I’ve gathered it and placed in in an interactive visualization. 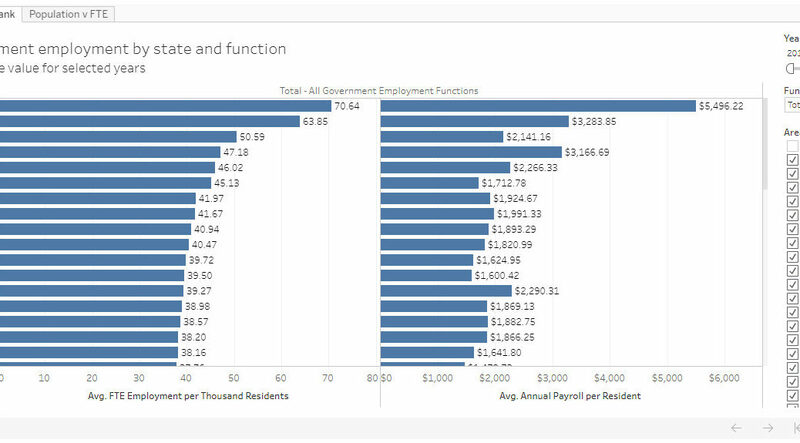 Click here to learn about the visualization and use it to make your own charts and tables. State population vs. local government employment per resident. Click for larger. For the first quarter of 2018, the number of jobs in Sedgwick County grew, but at a rate slower than the nation. Data released today from the Bureau of Labor Statistics, part of the United States Department of Labor shows an improving labor picture in Sedgwick County, but one growing at one-fifth the rate of the nation. For the first quarter of 2018 there were 12,500 establishments in Sedgwick County employing 247,800 workers. That is an increase in jobs of 0.3 percent from the same time the previous year, a rate which ranked 293 among the nation’s 350 largest counties. For the same period, the national job growth rate was 1.6 percent. The average weekly wage was $967, an increase of 2.4 percent over the year, that change ranking 228 among the same 350 largest counties. The U.S. average weekly wage increased 3.7 percent over the same period. For July 2018, more jobs in Kansas, and a nearly unchanged labor force. Wichita jobs also rose. Data released today from the Bureau of Labor Statistics, part of the United States Department of Labor, shows an improving jobs picture for Kansas in July 2018. 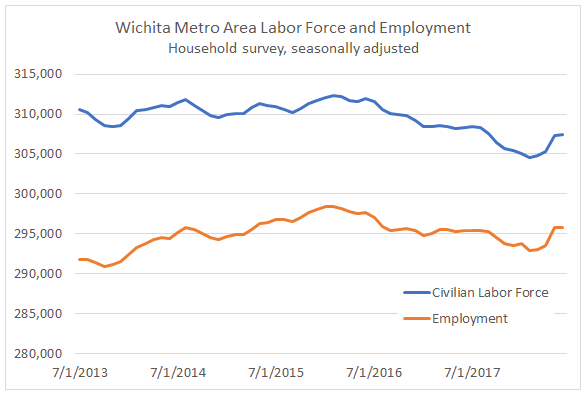 Over the year (July 2017 to July 2018), the Kansas labor force is down slightly, while up slightly over the past three months. These changes are small, all being in the range of 0.1 percent. The number of unemployed persons continues to fall. The unemployment rate remains at 3.4 percent, down from 3.6 percent from one year ago. The number of Kansas nonfarm jobs for July 2018 rose by 1.7 percent over last July, adding 23,400 jobs. This is using seasonally adjusted data, and the non-adjusted figure is larger at 24,900. Comparing June 2018 to July 2018 isn’t meaningful using this data, as it is not adjusted for seasonality. Of note, the same data series for the nation rose from 146,486,000 to 148,901,000 over the year, an increase of 1.6 percent. 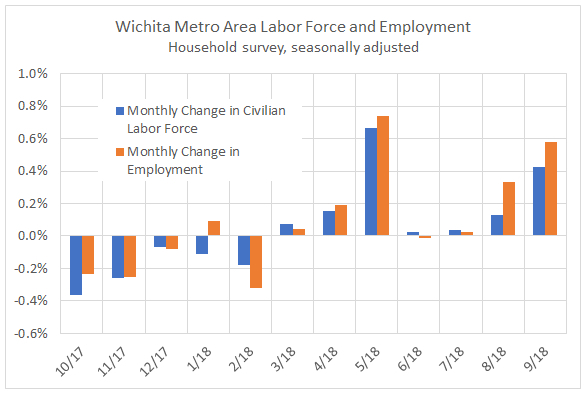 For the Wichita metropolitan area in June 2018, jobs are up, the unemployment rate is down, and the labor force is smaller, compared to the same month one year ago. 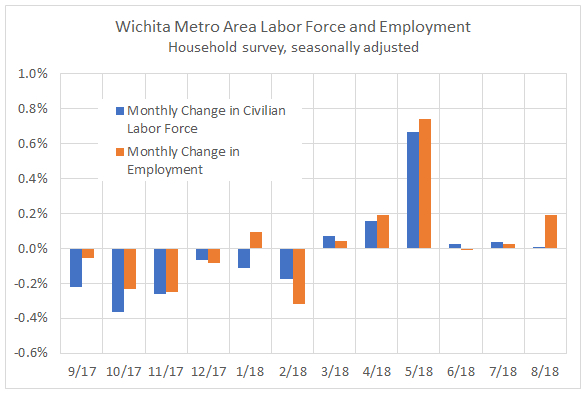 Data released this week by the Bureau of Labor Statistics, part of the United States Department of Labor, shows an improving employment situation for the Wichita Metropolitan Statistical Area. Of note, the same series of data for the nation rose from 147,578,000 to 150,057,000 over the same time, an increase of 1.7 percent. The unemployment rate fell to 4.0 percent from a year ago. Part of the improvement in the unemployment rate is due to a slightly smaller labor force. Considering seasonally adjusted data from the household survey, the labor force rose slightly from May 2018, and employment was unchanged. This is a slowdown of a positive trend in the previous three months. 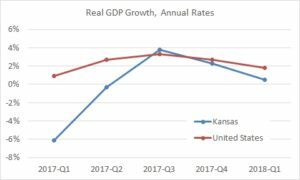 In the first quarter of 2018, the Kansas economy grew at the annual rate of 0.5 percent in real terms, slowing from the previous quarter. 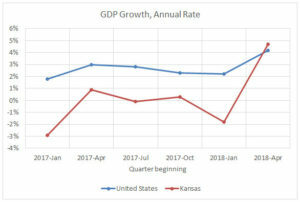 In the first quarter of 2018, the Kansas economy grew at the annual rate of 0.5 percent in real (inflation-adjusted) dollars, according to statistics released today by Bureau of Economic Analysis, a division of the United States Department of Commerce. GDP for the quarter was at the annual rate of $161,551 million. This is a decline in the rate of growth from the fourth quarter of 2017, when the rate was 2.3 percent. The first quarter numbers put Kansas in 47th position among the states, with only Arkansas, Idaho, and North Dakota posting lower numbers. Quarterly GDP can be volatile, as shown in the nearby chart. Agriculture, forestry, fishing, and hunting, down by 1.08 percent. Wholesale trade, down by 0.13 percent. Management of companies and enterprises, up by 0.07 percent. Administrative and support and waste management and remediation services, unchanged. Educational services, up by 0.01 percent. Arts, entertainment, and recreation, down by 0.03 percent. Accomodation and food services, down by 0.03 percent. For June 2018, more jobs in Kansas, and a nearly unchanged labor force. 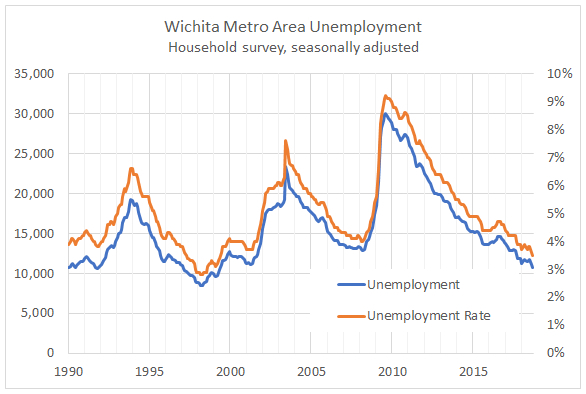 Wichita jobs also rose. Data released this week from the Bureau of Labor Statistics, part of the United States Department of Labor, shows an improving jobs picture for Kansas in June 2018. Over the year (June 2017 to June 2018), the Kansas labor force is down slightly, while up slightly over the past three months. These changes are small, all being in the range of 0.1 percent. The number of unemployed persons continues to fall. The unemployment rate remains at 3.4 percent. The number of Kansas nonfarm jobs for June 2018 rose by 1.8 percent over last June, adding 24,800 jobs. This is using seasonally adjusted data, and the non-adjusted figure is larger at 30,900. Comparing May 2018 to June 2018 isn’t meaningful using this data, as it is not adjusted for seasonality.